If you are able to help volunteer in any way please contact us at tuxedopto@gmail.com. Every little bit helps. PTO Back to School Carnival Wristbands! Once again we are offering ENTRANCE WRISTBANDS & VALUE-ADDED WRISTBANDS for PRESALE in order to cut down on lines at the ticket booths and enable everyone to enjoy more of the festivities. The WRISTBANDS allow unlimited access to the games, inflatables, and most activities. 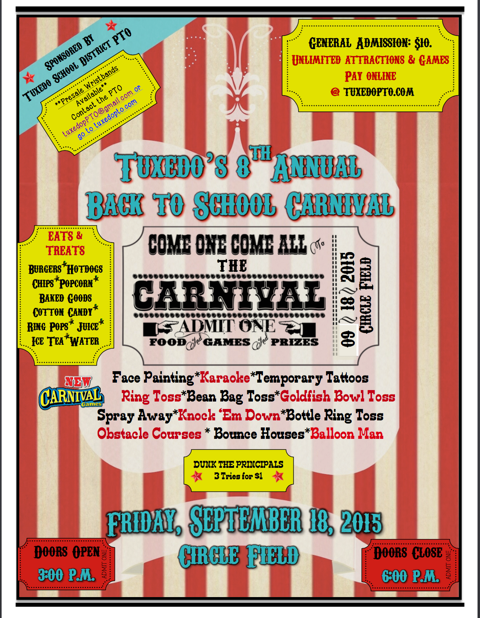 Go to tuxedopto.com/carnivaltickets to pre purchase your tickets online. This option will be available until Thursday September 17th. Pre ordered wristbands can be picked up at the check in table at the carnival. 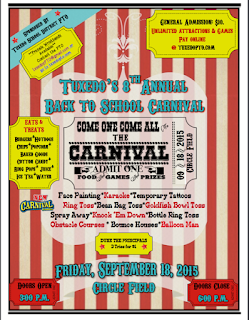 Volunteers are needed for the carnival, if you can help in anyway please contact the PTO at tuxedopto@gmail.com.